I've decided to have a break from knitting and start sewing these together. Due to the overwhelming presence of the isocelese triangle pattern - as mainstream as television commercials, no less - I'm not as enthusiastic about this project as I was at the outset. 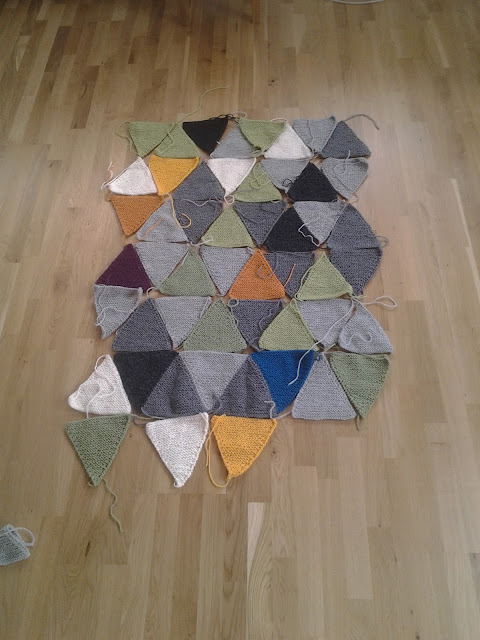 I've decided to knit five more triangles, to produce a small, lap blanket, and take a break from it. Neither does it help that I've had an idea for another project that I'm really excited about! More about that in a larger post.